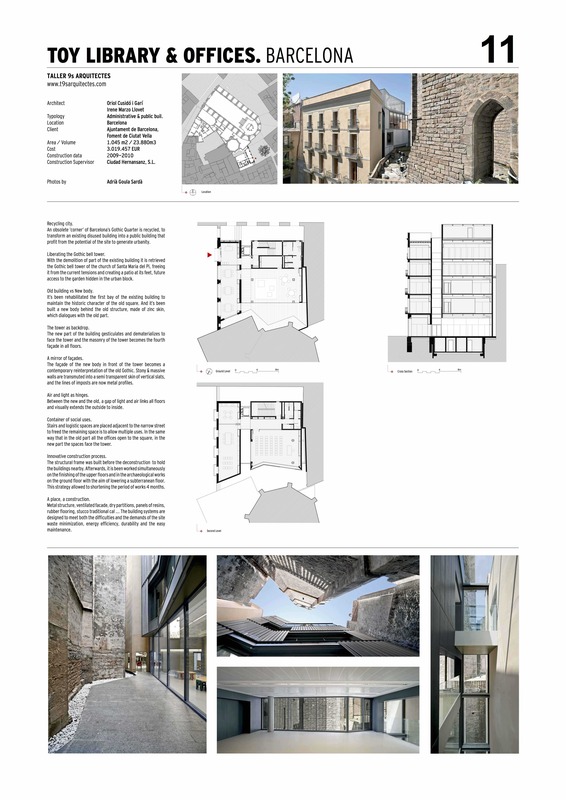 The aim of the intervention was the recovery of a ‘corner’ of the Gothic Quarter, a sensitive area from urban and heritage point of view, transforming the existing obsolete building into a container of public uses. As a result, the gothic tower of the church Santa Maria del Pi, hidden for centuries, was liberated. It was restored the first bay of the building to maintain the historic character of the square and it was built a new body behind it which interacts with the existing. The new metal container gestures and dematerializes when it faces the tower, thus the masonry of the tower thus becomes the fourth closure of the space on all floors. Among the new and old, a cut of light and air link all floors and visually prolong the outside towards the inside. The new body’s facade facing the tower is conceived as a contemporary reinterpretation of the old Gothic. The stony matter, massive, is transmuted into a semitransparent skin, the lines of stone are now metal profiles.